As promised, here are my thoughts on Jack Kirby’s The Eternals, which on the whole is eerily reminiscent of New Gods … except when it isn’t. The more I think about it, there seem to be a couple of big differences and a lot of superficial similarities. First, some background for those who need it. The Eternals’ basic premise is that extraterrestrial half-mile-high giants called Celestials created, from prehistoric humans, two additional species: grotesque Deviants and regal Eternals. The Deviants subjugated humanity, whereas the Eternals protected it; and to various degrees Celestials, Deviants, and Eternals all ended up as part of human mythology. 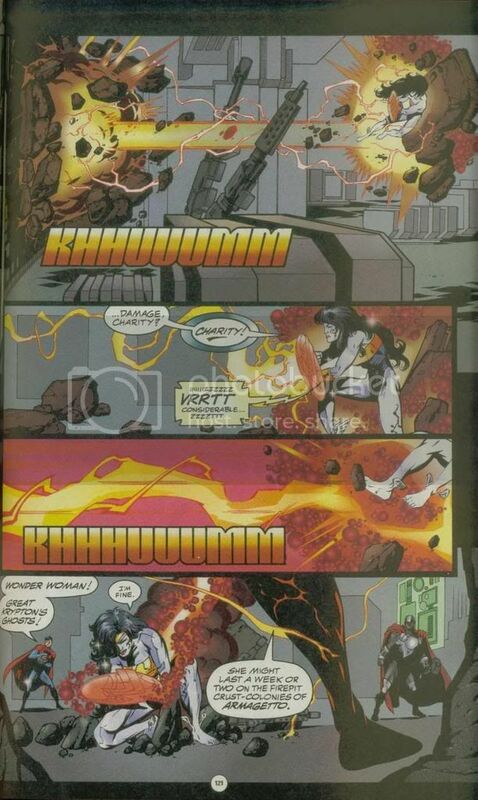 The Celestials left Earth soon after their experiments were complete, only to return (at the start of Eternals vol. 1 #1) for an evaluation of Earth lasting fifty years. The return of the Celestials prompted the Deviants and the Eternals to emerge from hiding, each with different designs on humanity; and of course the humans had to figure out how to react to these various developments. Now, I said earlier that The Eternals felt a lot like a “do-over” of New Gods … and while it still does, clearly New Gods (and the larger Fourth World) has a fairly different setup. Kirby’s Fourth World was a sprawling attempt to create a new set of myths — advertised as “an epic for our time” — centered around a mismatched set of fathers and sons. To cement a truce between the warring worlds of New Genesis and Apokolips, their respective leaders each agreed to raise the other’s son as his own. Thus, the hot-tempered Orion was raised by Highfather, and the peace-loving Scott Free was consigned to Darkseid’s brutal orphanage. In fact, while The Eternals begins on Earth, with a scientist and his daughter discovering that their strapping manservant is Not What He Seems, New Gods begins with “a time when the old gods died,” and launches from there into tours of New Genesis and Apokolips. New Gods #1 ends with Orion’s discovery that Darkseid has been kidnapping Earthlings for his Anti-Life Equation experiments, and that sends Orion to Earth, where much of the rest of Kirby’s Fourth World takes place. So yes, right off the bat the two series demonstrate storytelling differences. New Gods starts with the “gods” and works towards the humans, while Eternals starts with the humans and works towards the gods. However, in both series the humans are important components of the story. Honestly, my initial reaction of Eternals-as-Fourth-World-revisited was based largely on the human characters. Once confronted with Eternals, Celestials, and Deviants, Margo and her dad displayed a kind of wide-eyed pragmatism which seemed to echo Darkseid’s kidnap victims. In both series, Kirby’s human protagonists don’t quite believe what’s going on, even as they try to rise to the occasion. I mention this not because it’s an unusual storytelling device, but because in my experience with Kirby’s other superhero work, the people encountering the “new gods” are superheroes themselves. Admittedly, here I am thinking of the Fantastic Four and the Inhumans/the Watcher/Galactus, but to a certain extent it applies to Superman’s role in the Jimmy Olsen stories which prefigured the rest of the Fourth World. Thus, to me Eternals and New Gods are set apart because their human characters have these “cold” consciousness-expanding experiences — not blunted or filtered by their existing relationships with familiar superheroes — which reveal to them some larger world of magic, possibility, what-have-you. In New Gods the revelation to the humans is about Darkseid and the Anti-Life Equation. In Eternals it’s about the secret history of human development. In both cases, though, Kirby is pulling back a curtain on humanity’s place in the universe, and using the very loaded word “god” to do so. 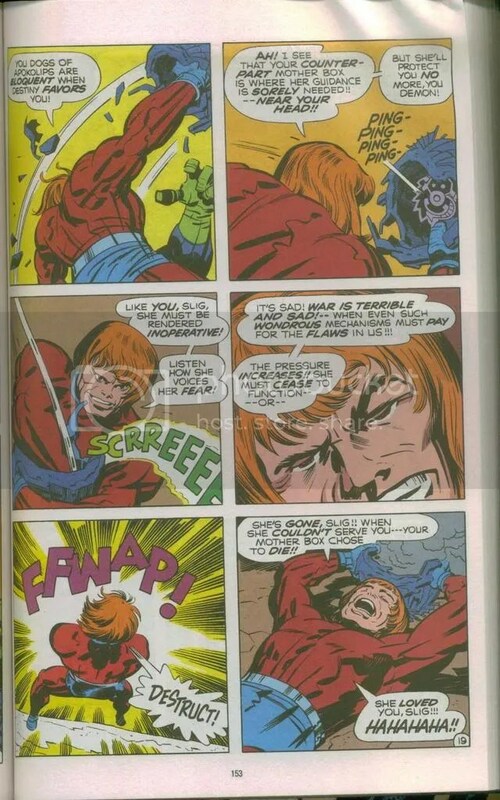 Instead, Eternals uses a series of antagonists to provide obstacles for Ikaris and friends to overcome. There are the Celestials; there is Kro, whose manipulations guide the plot of the first few issues; and there are various entities who try to destroy the Celestials over the course of the book’s short run. However, despite Kro posing as the Devil, Eternals has no personification of evil to compete with Darkseid and his overarching quest for the Anti-Life Equation. 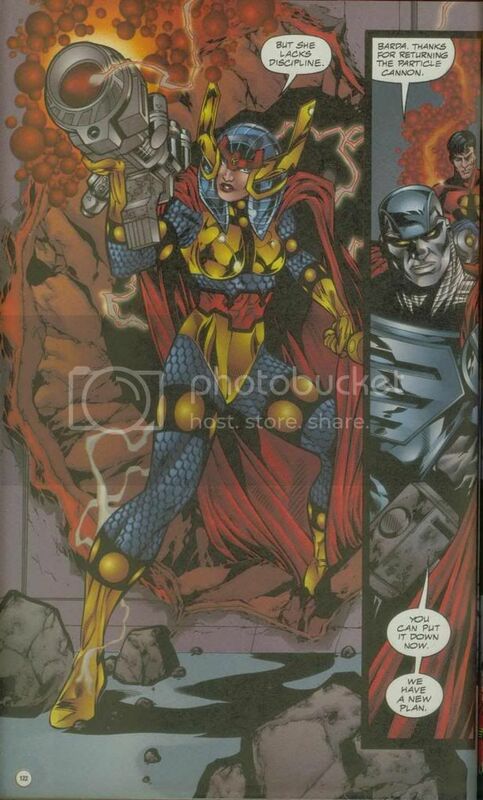 Indeed, Eternals’ setup is pretty much the point of the series. Honestly, it is open-ended enough to be the premise of a TV show. (In fact, the late-‘90s show “Prey” starred Debra “Remember me from ‘Ned & Stacey?’” Messing as a scientist who deals with warring factions of ultra-advanced humans.) Compare that to the Fourth World’s stated end-point, the final battle between Orion and Darkseid in Apokolips’ Armagetto. And that brings up the last thing I want to mention: the fact that Kirby never got to finish either series to his satisfaction. Maybe that’s why he didn’t build a practical ending into Eternals, and why he felt free to, say, devote three issues to a battle with a robotic Hulk. I think that’s the biggest part of my “do-over” vibe: the notion that Kirby wanted to get all the important stuff out of the way first. Kro is no Darkseid because his bad-guy arc is over pretty quickly: after his Devil ruse, he shifts gears and rekindles the torch he carried for Thena. Meanwhile, Thena becomes more of a protagonist than Ikaris, “recruiting” the Reject and Karkas to the Eternals’ side. 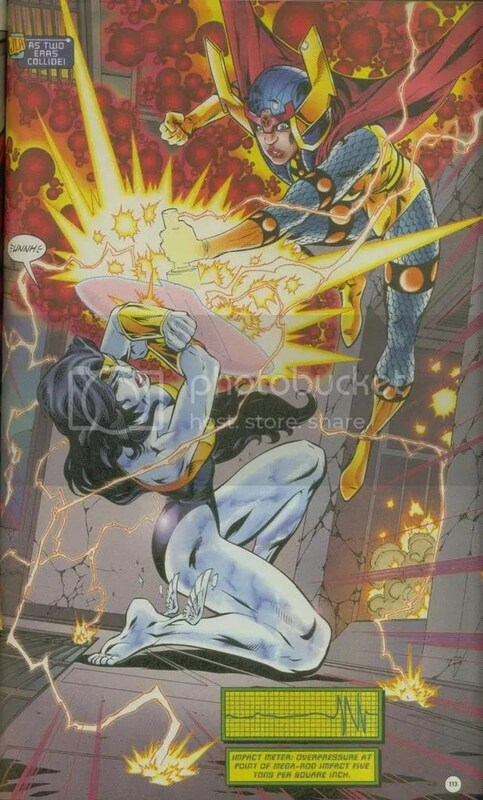 Obviously I can’t say that Kirby got bored with Ikaris, but you sure can tell that he’s not the central figure Orion was. Of course, related to Kirby interruptus is each series’ post-Kirby fate. If Eternals was supposed to be part of the larger Marvel Universe, I just have one question: how did Marvel explain the 2,000-foot-tall armored giants which Kirby left stationed around the globe? I can easily imagine Eternals recast as a modern-day Big Comics Event, crossovers and all, with Celestials instead of registration acts or red skies. Maybe Marvel has done that already. I’d be surprised if it hadn’t. For that matter, I think DC was trying to do exactly that with the Fourth World and Countdown, even rewriting Forever People #1 as a three-issue Superman Confidential story. That’s getting a little off the subject, but not by much. The Eternals still seems to me to be a “do-over” of New Gods maybe not in the nuts and bolts of its storytelling, but as another example of Kirby’s mythological consciousness-expansion which was cut short. The Fourth World takes on the future as the 853rd Century’s Justice Legion A invades the Justice League Watchtower! This isn’t the only fight, of course; but by the time we check in with these combatants, it’s pretty much over. A particle cannon (with Kirby Dots (TM), even!) 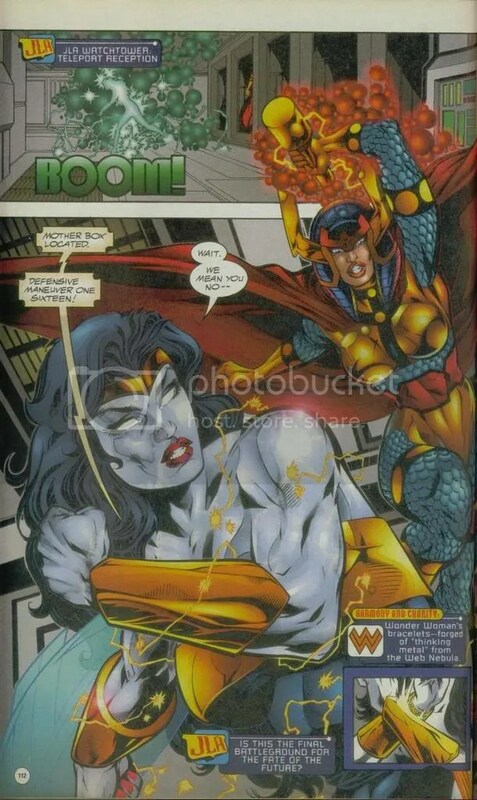 might seem like cheating, but hey — it’s not like Wonder Woman didn’t know who she might run into, back in the mists of history…. It’s always the right time for Bahlactus! 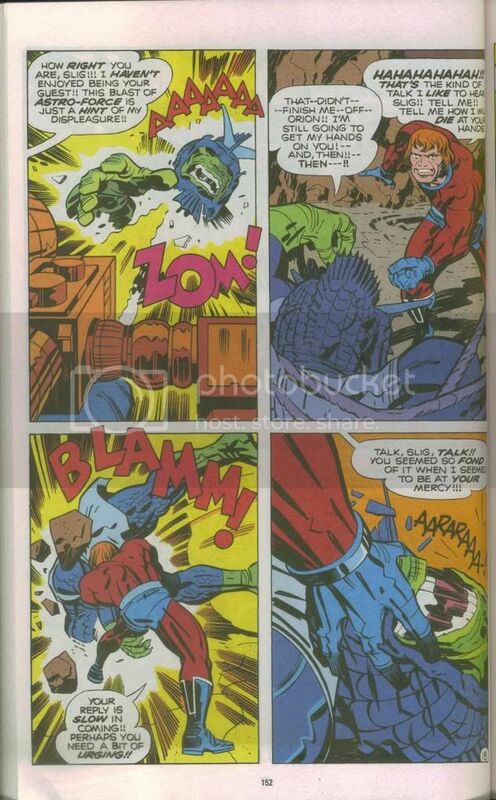 I like this sequence for the unrestrained glee that Orion brings to both the verbal and physical beatdowns. It’s not quite anti-heroic, but it’s not exactly good sportsmanship, either. Of course, laughing about the Mother Box’s sacrifice is just cold, especially since Fourth World readers would already have seen DeSaad torture a “good” Mother Box in Forever People. Still, I get the feeling Orion would have said much the same things about Slig’s real mother….